Abstract. Tropospheric ozone (O3) is a global warming gas, but the lack of a firm observational record since the preindustrial period means that estimates of its radiative forcing (RFTO3) rely on model calculations. Recent observational evidence shows that halogens are pervasive in the troposphere and need to be represented in chemistry-transport models for an accurate simulation of present-day O3. Using the GEOS-Chem model we show that tropospheric halogen chemistry is likely more active in the present day than in the preindustrial. This is due to increased oceanic iodine emissions driven by increased surface O3, higher anthropogenic emissions of bromo-carbons, and an increased flux of bromine from the stratosphere. We calculate preindustrial to present-day increases in the tropospheric O3 burden of 113Tg without halogens but only 90Tg with, leading to a reduction in RFTO3 from 0.43 to 0.35Wm−2. We attribute ∼50% of this reduction to increased bromine flux from the stratosphere, ∼35% to the ocean–atmosphere iodine feedback, and ∼ 15% to increased tropospheric sources of anthropogenic halogens. This reduction of tropospheric O3 radiative forcing due to halogens (0.087Wm−2) is greater than that from the radiative forcing of stratospheric O3 (∼0.05Wm−2). Estimates of RFTO3 that fail to consider halogen chemistry are likely overestimates (∼ 25%). How to cite: Sherwen, T., Evans, M. J., Carpenter, L. J., Schmidt, J. 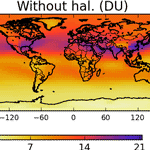 A., and Mickley, L. J.: Halogen chemistry reduces tropospheric O3 radiative forcing, Atmos. Chem. Phys., 17, 1557-1569, https://doi.org/10.5194/acp-17-1557-2017, 2017. We model pre-industrial to present day changes using the GEOS-Chem global chemical transport model with halogens (Cl, Br, I). The model better captures pre-industrial O3 observations with halogens included. Halogens buffer the tropospheric forcing of O3 (RFTO3) from pre-industrial to present day, reducing RFTO3 by 0.087 Wm−2. This reduction is greater than that from halogens on stratospheric O3 (−0.05 Wm−2). This suggests that models that do not include halogens will overestimate RFTO3by ~ 25%.